This isn't an excuse to unabashedly criticise Assassin's Creed 3 and 4 by any means. I didn't enjoy Assassin's Creed 3 by any means, but I did find that Assassin's Creed 4 was a surprisingly refreshing twist on a series whose best years were clearly behind it. With Assassin's Creed 4 I will say that an element of fun has been recovered from whatever flair was lost in 3, which relied far too heavily on a hand holding formula, broken up by cutscenes which contained a noticeable lack of interesting characters or engaging story. The fact that it also failed to uphold its responsibility of being an acceptable conclusion for the Desmond storyline is also such a huge point against it, that it in some ways may have managed to blind my judgement of it somewhat. I want to point out that obviously I have biases and my disdain for Assassin's Creed 3's ending will be the first to be laid out as an unacceptable and thoroughly lazy component of that game for me, for reasons that I will go into. But with the arrival of Assassin's Creed 4, I am at least relieved of one thing. That thing being that the Creed series has now forgone any possible denial that it is now no longer just a cash cow, for yearly updates to be pumped out of. What started out as a series with a long gestation period of several years which showed massive tweaks and adjustments in each instalment had by the end become a yearly update of unchanged and increasingly lazy content. At least now with the overarching story out of the way, which by its declining years I had already invested far too much time and money into seeing the conclusion of, I now no longer feel any personal pressure to purchase the newest one, becoming increasingly outraged as each subsequent instalment declined in quality. I can now view the series in hindsight and finally, let it go. I can view it as a whole and now enjoy the parts which I liked, whilst ignoring what I didn't and not feel as if every further release was bastardising the series as a whole. I can now view it as the sum of its parts. So what is Assassin's Creed about then overall. Well in its moment to moment action, Assassin's Creed is the story of a long standing secret society known as the Assassins, who are in a constant battle which rages across the centuries against another secret society known as the Templars who are intent on enslaving the world and all of its populace. What makes Assassin's Creed stand out from most other conspiracy stories is how confidently and fully it jumps into our own history here on Earth as the setting for its stories. The entire theme of the series could be boiled down to “history is written by the victors” and it is in this historical and moral uncertainty that Assassin's Creed revels in. The backdrop to nearly every Assassin's Creed game is mostly always an event that is unknown to the general public, yet a significant part of history. In the first Assassin's Creed it is during the Third Crusade; an attempt by several European leaders, the most prominent of them being King Richard I of England, attempting to take the Holy Land from Saladin. This is of course only the foreground to the real story. It's under the cover of this initial conflict where the true battle for victory lies as fractured groups of the Templar society carry out their own power plays in the chaos. 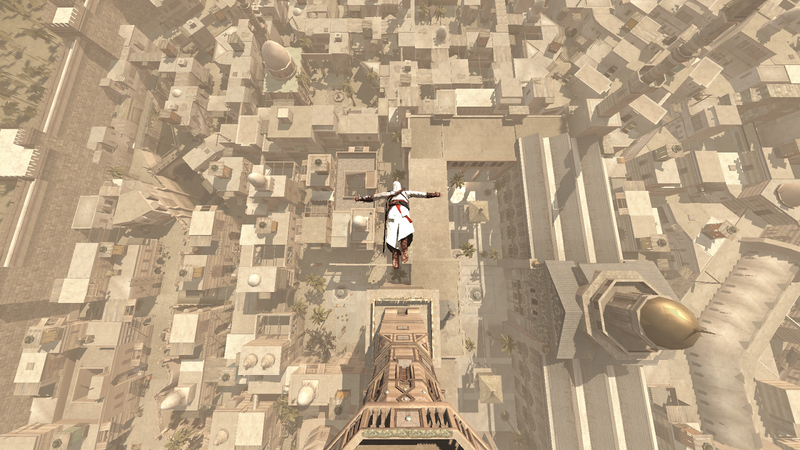 It's in this historical grey area, where Assassin's Creed's strength lies. The games can be both set in real events, which give the setting the richness and complexity that wouldn't be as strong in an entirely fictional world. However, these events can be played with in order to benefit the narrative by wielding the notion that history has not been documented in the purest light. History is not a record, it's an interpretation, one that has always been at the mercy of myth makers and conspirators. 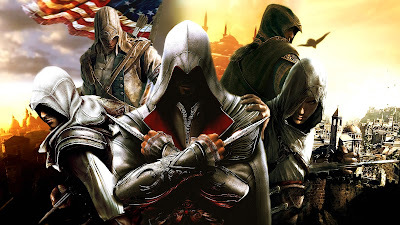 Assassin's Creed begins by introducing us to our assassin protagonist Altair, who has been sent on a mission to take back a rare treasure by his mentor and head of the creed, Al Mualim. He is joined by several others, including Malik Alsayf, all of who warn Altair that he has become too hot headed and prideful in his approach to the mission. The game subtly opens with Altair killing a guard to demonstrate this. Altair's companions berate him but Altair brushes it off and claims that he is simply doing what was asked of him to complete the mission. As the group makes its way deeper into Soloman's temple, where they hope to find this treasure, they eventually run across our main antagonist Robert De Sable, a French commander who has come over with the crusader armies. 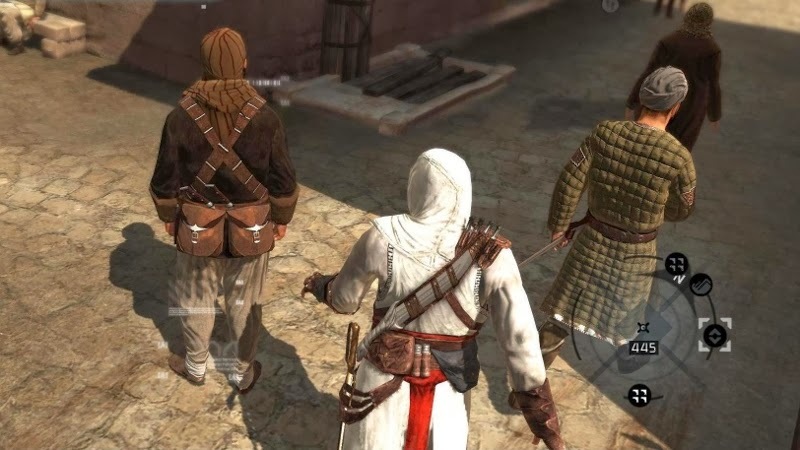 Altair rushes in to kill Robert in order to seize the treasure, but Robert takes advantage of Altair's haste, beating Altair in combat and apparently killing all of the other assassins. He sends a defeated Altair back to Al Mualim, who waits in the assassin stronghold of Masyaf, to inform him of the mission's failure. 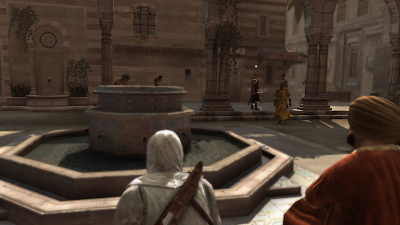 Altair returns to Masayaf to admit his failings but finds Malik there, treasure in his only remaining hand having had the other arm cut off during the fighting. Malik is explaining to Al Mualim how he escaped with the treasure and how Altair had jeopardised the entire operation. Al Mualim is incensed with Altair's arrogance, stripping him of his rank and weapons. In order to gain back his honour and possessions, Altair must track down Robert and his 8 accomplices, all of whom know about the existence of the mysterious treasure. 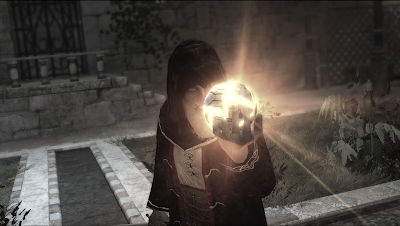 The game quickly sets up both the arc of Altair's character from a narrative standpoint, whilst simultaneously setting up the gameplay progression. As Altair works his way up the ranks he will not only uncover the conspiracy that has been put into action by Robert's accomplices; but also have to reassess his recent actions, be humbled by his fall from grace and face guilt from the effects he's had on his comrades of the creed. From a gameplay standpoint, Altair will also earn back title and equipment and so be awarded with new areas to visit as well as an increasing move set and stat upgrades. The game's set up is very strong, however it sadly quickly falls into repetition. Unlike most sandbox games, the standard rules of which its sequels adhere to much closer, Assassin's Creed's mission structure revolves around 3 basic tasks that must be repeated within each city. Many other sandboxes will involve the player going to a point on the map, being given a story progressing mission involving various sub objectives and then go on to complete them. In Assassin's Creed however, the mission structure is a lot less varied, with each overall assassination contract not being comprised of several mission but instead several minigames or activities that are spread throughout the city. Each contract is therefore one large mission which can take between 30 minutes to an hour to complete and revolves more around fact finding than player skill. Once given a target, the player will travel to the Assassin's bureau in one of the three cities of the game: Acre, Damascus or Jerusalem. There the player will be given more detailed information regarding the target and then is let loose on the city to obtain information on the contract's whereabouts and dealings in order to plan an assassination. The basic structure from here on in is simple. The player must climb selected tall buildings and activate viewpoints to open up these fact finding activities. There will be 7 activities per city, of which the player needs only complete 3 in order to then proceed to the main assassination. Among this selection of activities, there will be 3 main types of activity to choose from. These are pickpocketing, in which the player will follow a courier and then with a timed button press, steal some sort of information. There is also interrogation, in which the player will follow a selected target into an isolated area and then beat them up to force them to give you information. Lastly there is eavesdropping, in which the player must sit on a bench nearby two targets and listen to them have a conversation. Eavesdropping is the least involved activity of the 3, since they are impossible to fail and all the player needs to do is activate the activity and then listen to a set conversation. Whilst all of these missions have an interesting narrative in themselves and go towards deepening your understanding of your contract's motives and personality, their easy and repetitive nature leaves little enjoyment in playing them other than simply learning more background details. Although Assassin's Creed sets itself out to be an action title, its mission structure leaves it feeling more like an adventure game, with the player following or listening to information for little more than narrative benefit and not the moment to moment challenge of taking part. This is severely revamped in later titles, with character involvement and skill becoming much more integral to completion, a fact that regardless of how well executed Assassin's Creed story is, could only go on to help the series. In it's current state, compared to the later games, the first Assassin's Creed also lacks any real replay value, as I discovered when playing through it again for the purpose of this article. The failure of Assassin's Creed 1 to truly utilise its control system comes to be one of its greatest failings. The controls appear to be built for a game that revolves around a much more action orientated game, which is only really utilised through the free running during player exploration and combat, both of which rarely, if ever come into play during the main campaign. The game mechanics and their fluid interchangeable nature is severely underused throughout the game. actions relating to the left hand, or since it is Altair's primary hand for holding weapons; aggressive actions. The right face button (square) is for actions relating to the unarmed hand and finally the bottom face button (Cross) corresponds to actions involving the legs and movement speed. The move set is also doubled due to the use of the profile system which allows for a character to transition between stealth and hostile actions, all of which continue to correspond to their respective body part. When in low profile, the default mode, hitting any of the face buttons will cause the Altair to perform the action in a stealthy manner. He will slowly push his way past people with his unarmed hand, walk slowly and bow his head so as to blend into the crowd when his legs are activated. When the hidden blade is activated, Altair will silently thrust his blade unnoticed into his intended target. If the head button is pushed then Altair will go into Eagle vision, a form of intuition where the screen will go dark and only highlight hostile or NPCs which can be interacted with. When in high profile all the actions remain consistent and as intuitive, although now Altair will carry out more noticeable and socially unacceptable actions. Eagle vision is now no longer available, leaving the top face button blank. When in this mode, which is activated by pressing R1 or RB, Altair's movement inputs will now be a lot faster as this causes him to go into a quick jog, which can be turned into a full on sprint, or free running when the bottom face button is pushed. When the unarmed button is pushed, Altair will now tackle and shunt characters who are in front of him so as to avoid tripping over and so interfering with his momentum. If the armed button is hit and Altair has his hidden blade equipped, then Altair will leap into the air and perform a quick assassination kill. The d pad switches between Altair's weapons, of which there are 4: hands, hidden blade, sword and throwing knives which can also double as a small blade. If any of the other weapons aside from hidden blade are activated, then Altair will attack I the same forceful manner and will immediately go into combat mode, which I will go into later. What is so impressive about the control system is that in a very few number of buttons, the number of actions that the player can achieve is surprisingly large, with the profile system offering a doubling up effect. The controls are flexible as the player can go from stealth section, to a fast paced escape sequence without changing the basic underlying concept of the control scheme. There is no random, 'hit X to interact with' since the body mapping of the controller keeps the game consistent and intuitive. There are no random rules, much like in many modern games where new orders and updates of the control scheme have to be plastered across the screen. If you have to interact with an item, then it'll simply be the empty hand input and if you have to kill someone then it'll be the armed hand input. The rules are executed and remain the same from the start. Switching between these different modes of play is quick and simple. You can go from sneaking in a crowd, fighting guards and then fleeing across the roof simply by switching profiles and unselecting your target. It is this fluidity and action orientated mechanics of the game that make me unable to fathom why the game is only action orientated during the actual assassinations themselves and not the rest of the game which is primarily watching people do things from street level. The assassinations themselves barely even utilise the mechanics anyway since many of them are simply watching a character talk and then running up to them, awkwardly trying to stab them as they defend themselves and then running away. These moments are rare and not designed particularly well for the player to control Altair adequately or apply any interesting strategy within their play. These are especially disappointing when you run around Assassin's Creed cities and realise just how layered and expertly designed they are. Any item that juts out more than a few inches can be grabbed on to and climbed, and it is this dynamic interaction with the environment, as well as the subtle and numerous free run paths that have been interwoven into the architecture that make Assassin's Creed such a blast to run around in when you're not constrained by the missions. There's nothing more satisfying than pulling off a perfect run or escaping from some guards, but this rarely happens in the main game and these moments are reserved for when you're by yourself and actively taunting the guards into a chase. The only time you do have to free run as a game completion imperative is at the end of a main character assassination and even then these come so rarely and are over so quickly that they're a flash in the pan compared to the overall play time. Combat in the Assassin's Creed series has always been an issue. The sword combat itself is simplistic although does rely heavily on timing and paying attention to the body language of enemies. Combat has greatly been improved in the later instalments, especially regarding the stealth assassination and distraction techniques that the player is able to utilise, but the basic sword play of parry and attack remains mostly unchanged and although beautifully animated and gory, is overly repetitive and easy when mastered. Strangely the combat was even simplified further from Assassin's Creed onwards, but this is a criticism that will be explored more at that chapter. For all of the game's problems though, many of which are fixed in later sequels, the atmosphere of the game cannot be beaten. As you run through the streets of Jerusalem hearing the people bustle around you, selling items at their market stalls and remarking your strange conduct as you shimmy up a wall or stabs an annoying peasant woman in the face, it really feels like you have stepped back in time. As far as immersion goes in games, I can think of fewer better examples that manage to draw a player in more than Assassin's Creed. The world it has reconstructed and bought to life again is at once similar to ours so as not to distance you from the experience, but is at the same time so very different to the world that we now live that it is almost impossible to not be in awe as you run across the rooftops of the Middle East. It's sort of the temporal equivalent of the uncanny valley, just different enough to interest you, but similar enough to engage you and make you feel strangely attached. This is all held together with an ambient soundtrack from Jesper Kyd that plays softly in the background complimenting the sounds of the city that play over it and drawing you in further. I could only describe the soundtrack as simply beautiful and haunting, as it rises and ebbs in the background reminding you that this is still a fragile illusion and that all of this has now gone. The sound design and overall design of the cities is nothing short of amazing, not only from a gameplay perspective to solidify the free running, but on an aesthetic point, everything strongly sets the tone and place of the game. One of the real achievements of the game is just how well the art design manages to blend together the modern and classical styles. The HUD has a lot of technical information regarding the player's stats under the guise of the animus program, (the science fiction backdrop to this historical conspiracy story that I will go into), yet against the backdrop of 12th century Holy Land it looks completely at home. One of the key themes in the game is just how similar the past is to the present. In the way we act, the stupidity and mistakes that people make and the lack of progression that the modern day Templars pity human kind for is all summed up in the cohesive blending of the past and present aesthetic design in the game. The game's plot is similarly handed with confidence. The defining idea behind both the Assassins and the Templar order is that knowledge is the true key to power and that it must be attained through questioning and holding nothing certain. They both fight for truth and the safety of all mankind and yet this is where their creeds end in their similarities. The Templars believe that human kind must be saved through control and order. The Assassins uphold that mankind must be protected and justice be served, but that no limitations other than this should be placed on them. Man's free will should remain intact because they are men and they wish for free will also. “Nothing is true, everything is permitted”. These are the vague words which the creed lives by and they will go unexplained fully until much later at the end of Assassin's Creed Revelations, but they are the words that govern the entire underlying ideas in the series. "To say that nothing is true, is to realize that the foundations of society are fragile, and that we must be the shepherds of our own civilization. To say that everything is permitted, is to understand that we are the architects of our actions, and that we must live with their consequences, whether glorious or tragic." These are the words of Ezio Auditore in Assassin's Creed Revelations, as he explains the creed's maxim. We must see the journey before we truly understand it, and if you can bring yourself to continue reading this, then we shall reach that part of the journey, but for now, this is the ultimate summation of what this game is about. We, the viewer, enter a scene where a group of 9 men who call themselves the Templars wish to make a change to the world. They want to save it. They have all come into contact with the strange treasure that we were sent for earlier, a treasure that has shown them something and made them question everything that their society taught them. What they saw we do not know. We know that this treasure is not from man and is of an origin that they couldn't possibly even begin to understand. The treasure in question, we later find out, is named a piece of Eden. It is an ancient and mysterious technology which allows the wielder to create illusions and trick people into believing whatever the user wishes. The user's span some of the most famous men in history and with that comes a horrifying truth. The Red Sea's were never parted by Moses. Water was never turned into wine and countless other miracles have been laid waste to as mere parlour tricks. Each man who has touched this artefact has come to know this. The enemy's we meet are now Godless, in a period where the existence of God is the accepted and apparently certain reality. There is a war going on in his name and yet these Templars can no longer accept this as fact. They have lost all footing in their lives and so decide to rebuild their own world. Just as the creed has claimed, there is no truth, no certainty; it is simply what we do and how we face ourselves that is the only matter of importance. The piece of Eden presents itself as a most interesting strategic force for any of these men to wield due to the underlying theme of the story. If history and even civilisation are not objective. If everything that man does in a social context is simply a product of what he has been raised to think, then surely with no objectives to be bound by, in order to change the very fabric of reality itself, all one must do is change the minds of the men who perceive it. It is the ultimate weapon. It is through each of the Templars and the dying conversations that Altair shares with them that we come to realise this objective uncertainty, which is what gives Assassin's Creed the complexity that is often overlooked in its characters and overall lore. Many of the men that Altair kills point out his hypocrisy for their cause. Upon killing Jubair Al Hakim, a scholar who is burning books, Jubair remarks in his dying words, after hearing Altair's criticisms, at how “am I not unlike those precious books you seek to save? A source of knowledge with which you disagree?” Altair condemns a man for acting and believing in much as he does. Altair is a hypocrite, but not because he is wrong or because Jubair is right, but simply because he believes himself to be more just. In another moment when Altair assassinates Abu'l Nuqoud, an apparently corrupt politician who has been taking the tax money of the poor and using it to fund his own private armies. He asks, “Is it so different than your own work? You take the lives of men and women, strong in the conviction that their deaths will improve the lots of those left behind.” “We are nothing alike”, replies Altair. “Ah, but you doubt”, Abu'l responds before breathing his last. Everything Altair comes to learn from these men is that he is no more right or better than them. That his enemy's motives and intents are just as honourable as his. Altair is doing just as they wish to do by having power over the piece of Eden. Altair kills in order to remove certain ideas and intents from the world. To rewrite history and change the world by adjusting the accepted methods of civilisation. The illusionary powers of the piece of Eden are simply just this but on a grander scale. 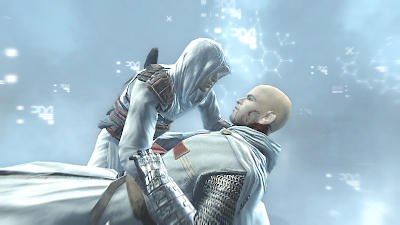 By the end of the game, Altair still believes he is right to stop the Templars, but by then he does not believe he is right simply because he is, but instead because it is simply what he believes. Altair has seen his failings, how unsure his life is. He has come to truly understand the creed and in doing so is now humble. He has lost not only his rank as an assassin, but has now also lost his right to his own beliefs; so completing the arc of Altair. The game also makes us question our own certainty in these antagonist bait and switches. We come into the game with the assumption that the Templars, who are portrayed as the enemy in the game are purely evil. As we research them and find out their deeds, whether or not they're book burning or slave trading, it is when we come face to face with each of these men that we learn that their actions have a deeper point. That they do not commit these sick acts for their own gain, but simply as “minor evils in service of a greater good”. 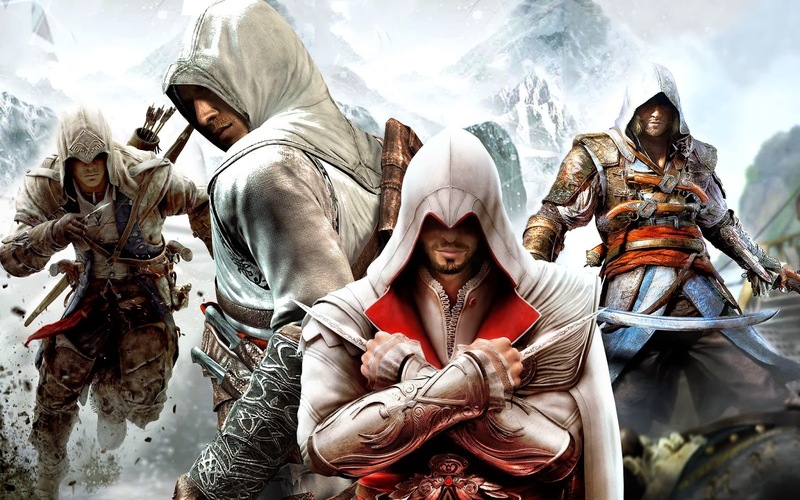 Just as Altair kills and murders, so do these men, yet we accept Altair's actions simply because we are in control of him and he is the main character. Altair is no more right than these men and by the end we continue to fight with Altair to save our own individuality and liberties, not because it is necessarily the best thing for us or because we are correct, but because it is what we believe we should do. We fight for ourselves and for our own liberty just as everyone else has done so far. None of the Templars wish to be controlled by the piece of Eden. It is they who want to control it and so everyone else. They desire their liberty, whilst us and Altair desire ours, it is simply to what extent we wish control over others that separates us. This idea of uncertainty towards who we should root for is concluded perfectly by the reveal that Al Mualim, your mentor and leader of the Assassin's creed, is in fact the 10th member of the original party who found the piece of Eden. Al Mualim had sent you to kill these other 9 of his past accomplices so he may have had the Eden piece for himself. You return to Masayaf in the final level to find him surrounded by the occupants of your home town, all now lost in a delirious state of obsessive loyalty for Al Mualim. He has tricked them into believing he is a god. As you fight your way to stop Al Mualim and finally confront him, you realise that even though he stand before you as your enemy, he has at no point defiled the maxim of the creed. Al Mualim is simply doing what he sees best to do. Your beliefs and standing are the same as your enemy yet again, it is simply in your justification for man's liberty and your own lack of personal desire for power that you differ. You and your enemy are fundamentally the same man. I don't think that up until this point in many mediums, especially games no less have I seen the theme and idea of the subjectivity of morals so clearly presented and well executed. The game clearly defines these two men, seemingly at odds in their moral judgement, as living by the same maxim. It is a very clever presentation of a story where there are clearly honourable characters who we root for because we believe in them and because they are nice, but where there also aren't any justifiably villainous characters either. The Templars are not all represented as having been strengthened and confident because of their new found knowledge. The abyss is a terrifying thing to have gazed into. The game portrays this remarkably well due to its setting far in the past. Whatever fear we should feel at knowing that our lives are meaningless and that we are alone, are at least comforted by our scientific knowledge about the world and the universe. The fears of these historical figures is a thousand times worse. They have come to learn that their grasp on reality, mostly held through religious texts, have all been rendered worthless. Where now do they look? Most of them look to themselves and find strength that they can control their own destiny, but several of the antagonists find this uncertainty far too great. Sibrand is an Italian soldier who is one of the few remaining Templars by the time Altair assassinates him. We find him paranoid, lashing out and executing several innocent men at his own delusions that they are coming to kill him. When Altair finally does kill him, Sibrand talk of his fear, of the nothingness that he knows awaits him after death. Altair is confused that returning to God does not comfort him, before realising that Siband now has no God to ease his suffering. This small layer of characterisation and variation among each Templar for the short period we interact with them adds a needed level of detail and depth to each one of the antagonists. It makes finally meeting them after a long period of investigation into their operations, a huge pay off. What starts as a simple case of black and white becomes slowly more skewed until by the time we kill this supposed scourge on mankind, we find that they are simply a misunderstood saviour much like ourselves. After all, Altair is out to help the people and yet is hunted and attacked by the city's guards who believe they are the people's protection. No one is the hero in this game through moral certainty, “nothing is real”, it's just simply the actions that they perform that are relevant, which is made more terrifying since “everything is permitted”. These constant twists in the narrative, as well as the thoughtful themes that present themselves during the steady build up and reveal of character's motives not only make Assassin's Creed an interesting story to discover, but also gives it a complexity and thoughtfulness that is far above the standard that most video games offer. And yet there is still an entire modern day story that is also happening. 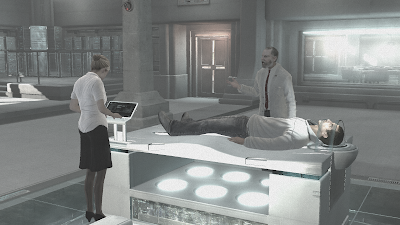 In short, the entire game is taking place in a machine known as the animus, a machine that creates a 3D simulation of the genetic memory of its user. Genetic memory is found in the DNA of all beings and as it sounds, is simply memory but stored in genetic code. It is explained that characteristics are passed down from a parent to their offspring such as eye colour and stature, and it is in this method that the memories of our ancestors also transfer down the generations. These ancestral memories manifest themselves in our behaviour as instinct. A baby bird knows how to fly because of this instinct, but the game says that instinct is not just some mystic a priori knowledge from the ether, but instead simply the shared and repeated experience of flying that each of its ancestors have had. When a bird knows how to fly it is because the stored memories of all its ancestors in its DNA is telling it how to do so on a subconscious level. It is the same with people and now a company known by the name Abstergo has found a way to unlock these memories. The person whose ancestor's memories they are studying is that of Desmond Miles, our modern day protagonist. Desmond is a bartender who once grew up in a strange gated community that we are told was the last stronghold of the modern day Assassin order, but escaped as a young man to go and live his own life. He is held being held hostage in a massive facility owned by Abstergo industries, a multinational commercial behemoth with Templar beliefs. There is a sad reminder in this situation that somewhere in history the Templar order has somehow overpowered the Assassin's order within the last thousand years. In a game where we spend most of it fighting and winning against the Templars, it is a striking reminder of just how much time has passed and how just much things can change over time. Yet this same there of civil stagnation returns once again. Mankind is prone to the same mistakes from era to era. The presence of the Templars still alive and moulding society so seamlessly to its own image, in what we believe to be an age of intelligence and civility, yet again reinforces the sad point, that time moves forward and things stay the same. Desmond is a descendant of Altair and of all the ancestors that will eventually be covered in this arc of the series, onwards to every cash in sequel after that. Trapped in a lab, Desmond's portion of the game is of a much more straight forward adventure style, with the player having the option of going to bed or exploring the Abstergo offices every time he is removed from the animus at certain segments of the campaign. Impatient players will most likely skip these parts and receive adequate background into what the Templar organisation has been up to for the past thousand years, as well as Abstergo's reasons for keeping Desmond hostage in the first place from the two scientists who Desmond interacts with during his cutscenes. More patient players however will find it quite fun to snoop around the small selection of offices after dark, listening in on conversations and hacking into computers to uncover some of the limited information that Desmond can get his hands on. This segment of the game has the narrative focus that the games main missions are so reliant on, often to their own detriment. However, without the ability for Desmond to run or fight, but instead simply walk and interact, the slower pace of the game is far more fitting to the play style in these segments. The control scheme and your options are more consistent with the adventure game feel of simple fact learning, than the missed opportunities of the unfulfilled action orientation of the main game. Here in these offices we don't learn much about Desmond, but there is some fun stuff regarding famous conspiracy theories, which are hinted to have involved recently discovered pieces of Eden. We also learn that the Templars wish to use Altair's memories to pin point the location of more pieces of Eden, in order to launch a satellite and brainwash the entire populace of Earth into submission. The ultimate conclusion of the Templar's millennia old plans. There is also some mention of an event set to happen in December 21st 2012, a mere 6 months from when the modern era of the game is set, but this will be a plot hint to be expanded in later potions of the game. The modern era then is a thankfully optional segment of the game, since it can be quite slow and won't interest players who want to return to the main meat of the middle age's plot, but seems to capture the play style of Assassin's Creed a lot better than what Altair's segments sporadically achieve. However, as a setup to Desmond, who will slowly become more relevant, it is a solid opening as it allows us to meet him, gain a basic understanding of who he is and gives us some cryptic hints about the current situation of both the Templar and Assassin factions. It also gives us a slight character arc for Desmond with the background of his abandonment of the Assassin order and later re-assimilation with it will be the basis of his journey. Ultimately though, these segments are light on plot, but viewing them now in conjunction with the whole series, this is a good start on what will become an increasingly less promising Desmond arc. Assassin's Creed has depth, not only of a narrative kind, but also philosophically. The game has a clear theme and arc and continues to develop and deliver on its ideas right until the very end. Even with the cliffhanger to set up the continuing sequels, the game manages to leave us wanting more, whilst at the same time feeling satisfied with the small part of Altair's life that we got to experience and conclude. What the first Assassin's Creed is left with though when compared to its sequels, is that it is an advert, or a tech demo of what the series will later become. It is a solid game, but a repetitive one nonetheless. However, whatever it lacks in mission design and lacklustre moments, it more than makes up for in its plotting and thematic execution. For a video game this really does have a lot more going on than was necessary and could've simply been a very basic B movie plot given how interesting its basic concept is alone. It is a testament to how much the developers cared, that they gave us a first game that worked as well as it did, whilst so dramatically refining and improving on the sequels that came after. What Assassin's Creed left me with whenever I complete it and put the controller down is a sense of longing, as if there's something missing once the credits roll and I sit in silence during the interim of deciding what to do with my life next. I used to think it was simply that what I had played was a bad and unsatisfying game. I have come to realise that it is simply because, for all its failings, Assassin's Creed's setting engrossed me so much, that when I do turn it off, I miss it. I miss the beautiful soundtrack and the freedom of running across a city and a place and time that is now dead and will never come back. And it is the fact Ubisoft have captured that distance so effectively that it saddens me when I leave, is more than I can credit most other games of doing. I hope you enjoyed this and hope that you will join me every Monday and Thursday for my continuing analysis of the Assassin's Creed series. From it's early promises, all the way to its latest enjoyable disappointments. I don't come on here to be happy, good sir, but a jolly fine analysis with pretty tune at the end. A good read. I agree with your analysis of a great game. Look forward to the others. As for the Knights Templar, whole lot of them wiped out Friday 13th 1307. Damn shame. If the death of your PS3 means more articles like this then long may it last. I remember being attacked by 10 guards in single file which sretched the imagination somewhat. AC 2 better? Incredible article, please do more. Hard to read on mobile. The Templars should be the heroes. Although then it would be Templars Creed which sounds rubbish. The 9/10 blue screens of death were so good, so cleverly done to make "Everything permitted"
At least the constant output of yearly sequels has disproved that "nothing is real". Riding a cash cow is very real.